It is not very often that SL drops you a gift out of the blue. Even rarer when Yar is the barer of such a gift. Way back in the dark ages, (November 22nd, 2008 in fact) Yar left Dio a present caged at Dio’s home in Stonehaven. Not unusual for a feline but this was a long time before Yar’s Neko days. The present was a cuffed and cocky young man named Santana. Santana often professed that he would take revenge on us and make us sub to him. He could not see that he was well and truely ensnared in our trap and he spent a very long time caged in our home in SH. Later we took him to Rivers Rock and locked in in a fine cell at our Hotel California where he spent several months. After that nice and comfy stay he was well conditioned and submitted to us. We both became fond of our captive and decided to make him a slave to the whole family as our time zones did not match fully. One thing shone through all this time and that was no matter when or where Slaveboy always remained loyal to us and made us proud to own him wherever he went. Finally on Jan 29th, 2011 we promoted Santana and made him full sub to us. 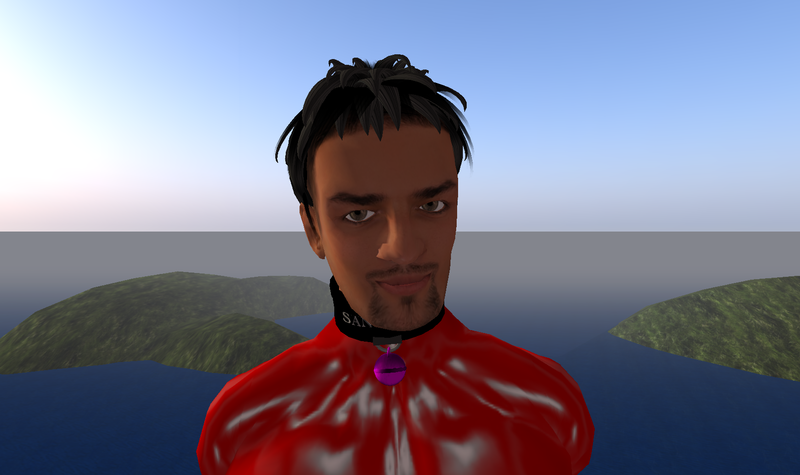 Slaveboy was send out to explore sims for us and on some he wrote lovely reports as known by those follwing this blog. And we will read more reports hopefully soon but our explorer has changed for now because ….Yar and SL played another trick. One magic potion later and our loyal family slave has been turned into a female Kitty. At first Jenny was not so keen on the idea while Diomita enjoyed his torment. Jenny tried to put forward a case to change our slaveboy back (Jenny has to admit that she missed him) but she was over ruled on all sides. Then very quickly we noticed a new and playful side to Kitty. Suddenly a confidence that was playful and funny emerged and even Jenny changed her mind. Kitty now has a challenge to collect more male clothes than female ones so she may change back. This is impossible as she gets new latex and pink clothes almost every day. Kitty has also been responsible for lots of damage in SL. We first noticed it in our home, and we confess there has been a lot in our friends and family’s homes too. First it started off with the occasional scratches, now we noticed wet patches and broken floorboards too. If you see any damage done by our kitty then please feel free to punish her in any way you choose. Of course we know that she will love it really.